Chorizo that’s low in fat and made with fresh chile, so it doesn’t give you heartburn? 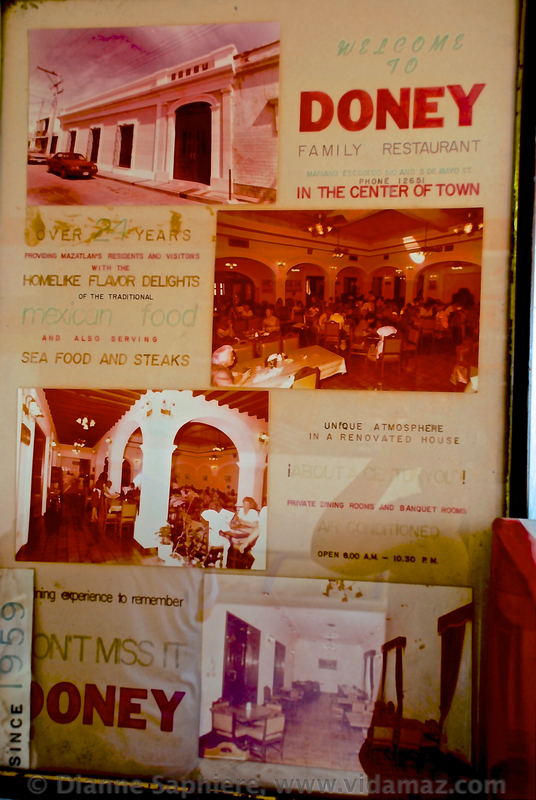 A history of Mazatlán as told by long-time family business owners (many of our readers may remember Restaurant Doney on Cinco de Mayo, now the government library). 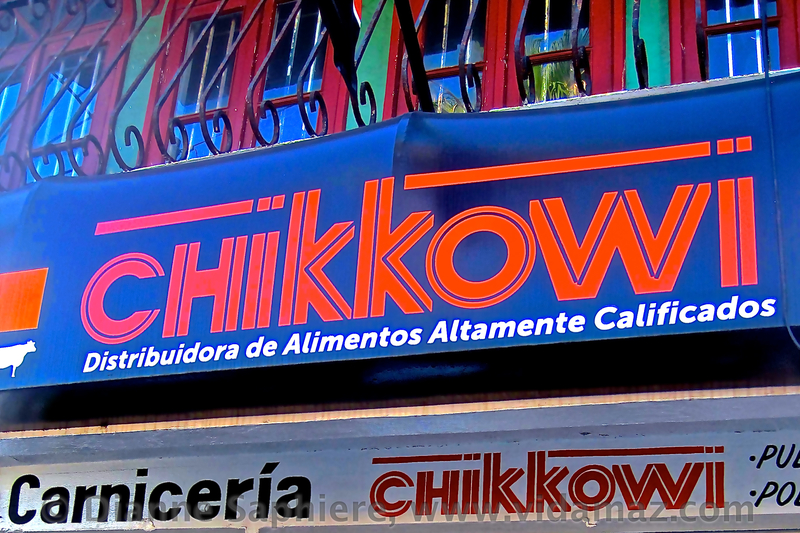 This multi-faceted carnicería is one we have been enjoying for a few months now, and is called Chikkowi. 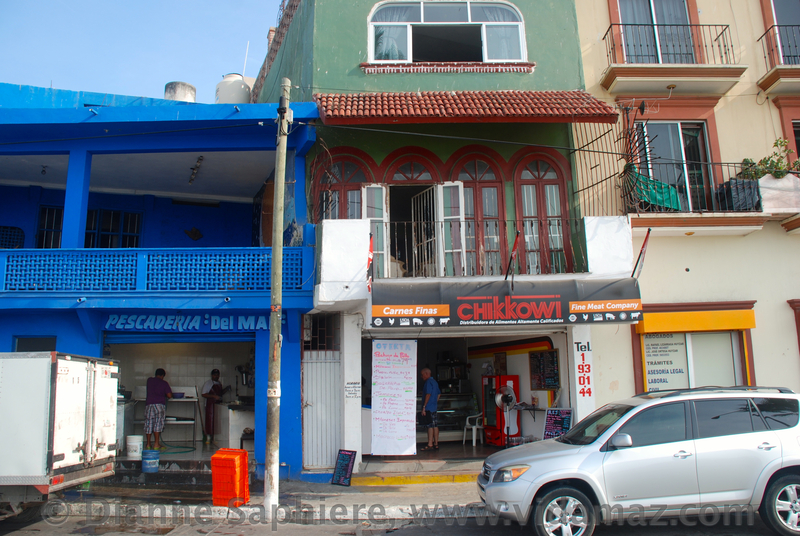 It is on the malecón, just north of the fishing pangas, right next to Pescadería del Mar (Paseo Claussen No. 97, telephone 193-0144). Alfonso Tirado Ibarra (Poncho) opened it in mid-June, and you can find him at work alongside his mother, Lourdes Ibarra Almada, Monday through Friday 8 to 3, and Saturdays 9 to 2. Poncho and Lourdes both speak excellent English as well as their native Spanish. Theirs is the family that ran Doney Restaurant on Cinco de Mayo for over 40 years. After it closed, Lourdes sold Kowi pork out of her home to friends, neighbors and restaurants, delivering it all over town for 20 years. 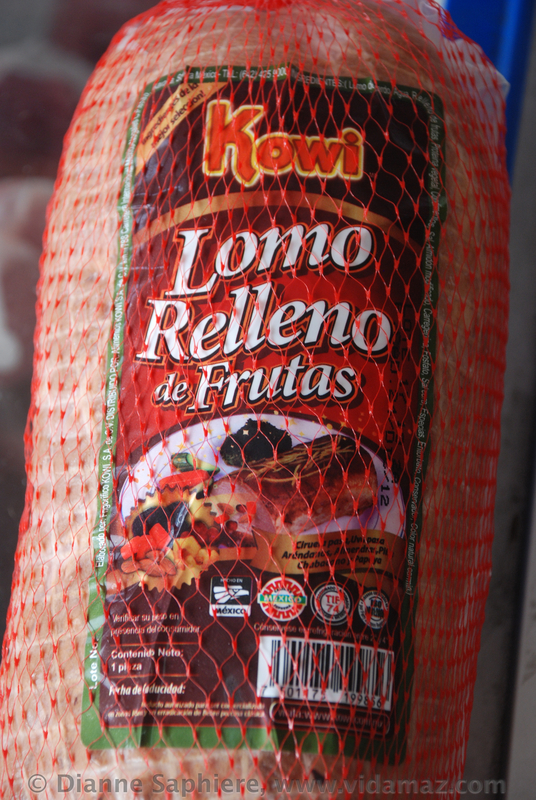 The Sonora-based Kowi company is owned by Lourdes’ brother-in-law, Manuel Santini. 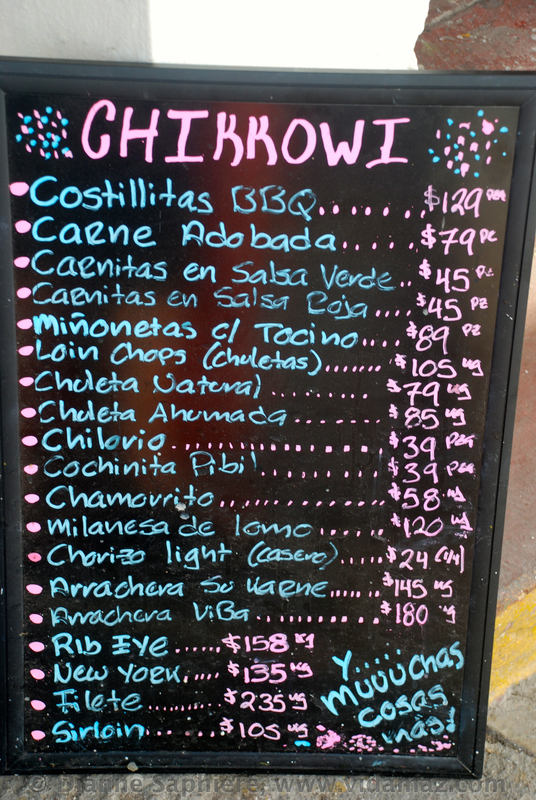 “Kowi” means “pork” in the native language from the Sonora area of Mexico. Kowi is a huge operation serving all of Mexico as well as the U.S., Japan and Korea. They are HAACP and USDA certified. They have various varieties of pigs and design custom diets to ensure the healthiest and tastiest pork products available. 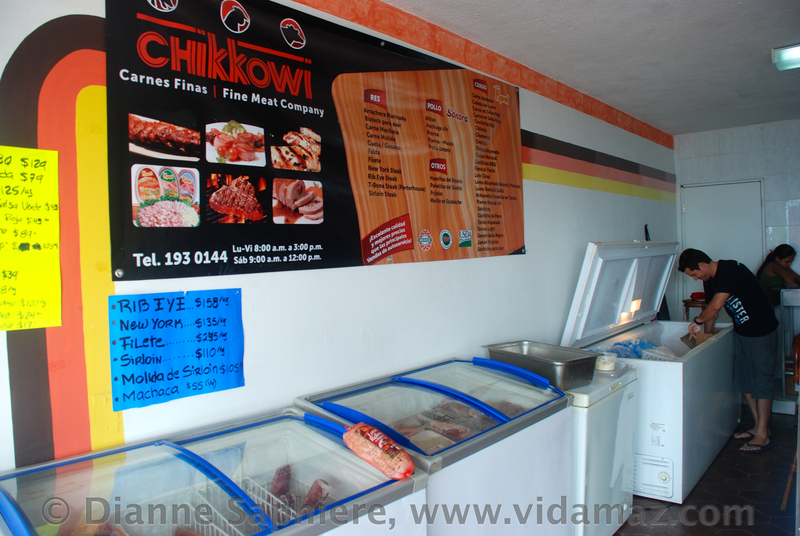 With grandchildren to tend to and her son home in Mazatlán, Lourdes and Poncho decided to open a store where anyone could enjoy the great pork products brought down from Sonora. Being Mazatlecos they know that locals don’t eat a lot of pork; here it’s fish and beef, followed by chicken, with pork in a distant fourth place. So, the mother and son team sought out the best beef and chicken as well to round out their offerings. The beef they bring in is from Monterrey; Monterrey and Sonora are known for having the best beef in Mexico. The chicken is also from Sonora. Sadly for us, they don’t (yet) offer lamb. 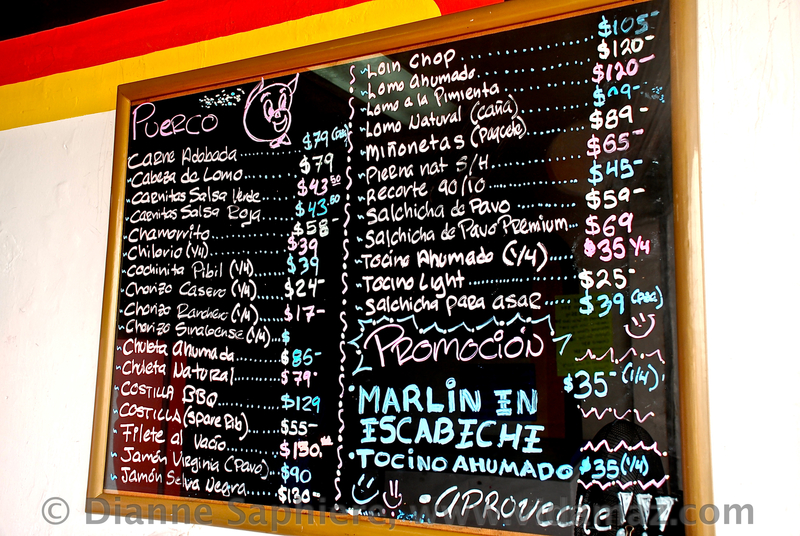 In addition to meats, they also have queso fresco from El Quelite and eggs from El Rosario. The offerings in the store are too varied to be described in detail here. We primarily want to share with you that we love having these products so close, part of our daily walk, and we’ve really enjoyed getting to know Poncho and Lourdes. If you take the time to stop in and meet these two, we are confident you will leave with something. You can choose pork tenderloins, pork medallions wrapped in bacon, pork roast stuffed with fruits, BBQ baby-back ribs, carne adobada, turkey salchichas for grilling, bacon, Canadian bacon, black forest ham, NY steaks, rib-eye steaks, whole tenderloins, sirloins, machaca (best in town for sure), the list truly goes on and on. Many items are pre-cooked and ready to heat up, while others are ready for you to make wonderful on your own. To help in this effort, they gladly hand out a series of recipes. They have wonderful plans for the near future as well. They want to add homemade, ready-to-cook meals such as meatballs, burgers, and marinated chicken breasts. And, in a throwback to Doney’s fame, they will soon be preparing cooked shredded chicken for enchiladas. They will package this with sauce made with the original Doney’s recipe for enchiladas suizas. This secret recipe is around fifty years old and has yet to be replicated outside of the family. 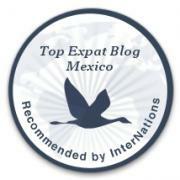 It is a Mazatlán classic. Poncho was born in Mazatlán, attended school at Anglo Moderno, graduated high school from Tec, and then moved to Monterrey to obtain his B.S. in food science. From Monterrey he went north to Washington DC and Miami, working for the nutrition-improvement NGO “Sustain.” They paid for him to get his M.S. in food science, sending the Mazatleco of all places to another beach paradise, Hawaii. He stayed in Hawaii for about eight years, working for a fresh, ready-to-eat food processing company (salads, fruit cups), and opening both catering (tacos) and surf tour businesses. Two years ago Poncho came home for Christmas, but he had a fever and a cough. Mom forced him to go to the doctor, which led to a diagnosis of stage 3 Hodgkins Disease. The following year was dedicated to chemo and radiation treatments in Culiacán and León, plus a crash course in anti-cancer nutrition research. A year of juicing and focusing on regaining his health, and 35 year old Poncho was able to both open his new shop in June, and, just last week, swim in the Travesía Anual with 200 others out to Deer Island (he swam the distance in about two hours)! Talk about an accomplishment! Doney Restaurant was opened by Poncho’s grandmother, Reynalda Velarde, or Doña Reyna, in 1959. It started out on a rented corner on Cinco de Mayo, becoming popular because she had the first rotisserie machine in Mazatlán. People would come to stare at it going round and round, fascinated, and this helped her business grow. Reyna took over more and more space, eventually purchasing an 1800s-era Spanish nobleman’s house (Casa Echeguren) on Mariano Escobedo in which to house her restaurant. Her son, Poncho’s father (also Alfonso), was an architect, and he remodeled and updated the house (which had also been a hospital), roofing in the central courtyard. Doney was very popular for over 40 years; I remember dining there often when I visited Mazatlán in the 70s and 80s. Doney was famous for its home style cooking: enchiladas suizas, camarones gobernador, regional food, and homemade pies and cakes. As I remember the interior was gorgeous, with arches and open space, and the walls were covered with historic photos. Sadly, the legendary restaurant closed in 1994, due to the economic downturn (you’ll remember that the value of the peso vs. the dollar halved in less than a week’s time) and the fact that Poncho’s father had been kidnapped (thankfully he survived the ordeal). Their business is doing quite well in the few months they have been open. They have begun servicing many restaurants in town as well as walk-in clientele. 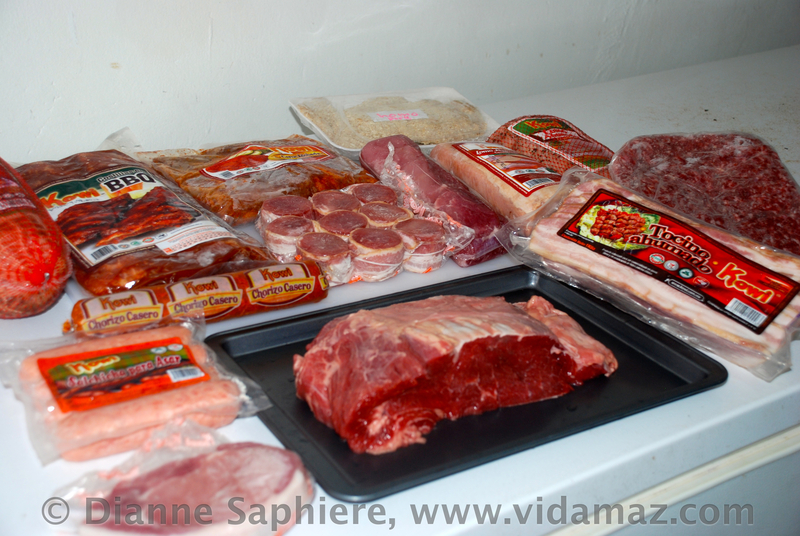 So, who knows, you may have already had some of their great meat products! Those of us who live here are always looking for something new and different. I think you will agree that Chikkowi fits that description. The pork loin at right is wrapped around a fruit center (plums, grapes, papaya, apricots, cranberries…) and is ready to heat and serve. We are excited for their early success and hope you will take the time to stop in and say hi. As they will tell you, there is perhaps no better view of Mazatlán than the view from their shop (featuring the pangas and all three islands). Doney’s may be gone but it is fondly remembered by many. Here’s wishing the family much success in their new endeavor! I’m sure they appreciate those well wishes, Pete! Have you been enjoying their meat and deli items? What is the point of such a lenghty review if you forget the phone number? Alex, I am sorry you don’t approve. My primary point in this post is to share a story about a wonderful guy and his family’s legacy to our beautiful city. There is a link in the post to their page, which happens to be on Facebook, as well as the address and phone number. I trust you will check them out and feel better tomorrow. there was a soup at doneys that was my very favorite. I would do anything for the recipe for chili con queso or chili de queso. not certain what it was. help !!!! Mike, they have loads of Doney recipes in the shop, and they serve lots of the old Doney menu, too. Just go in and visit/eat/enjoy!